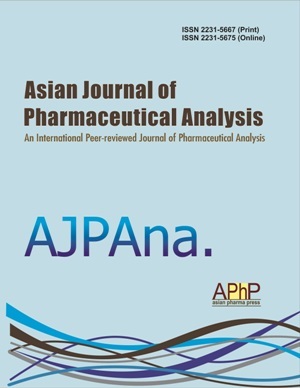 Asian Journal of Pharmaceutical Analysis (AJPAna) (ISSN: Print-2231–5667, Online-2231–5675) is an international, peer-reviewed journal, devoted to pharmaceutical analysis. AJPAna publishes Original Research Articles, Short Communications, Review Articles in all areas of pharmaceutical analysis. The journal is published quarterly every year in last week of March, June, September and December from Raipur, India. . . . . Read more. Online since Sunday, Mar 31, 2019 Accessed 420 times.